This summer residents in the East End, Mount Gould and St Judes areas of Plymouth will be offered free personalised travel advice by Plymouth City Council to help them make the most of the city’s many walking routes, cycle ways and public transport services. This summer’s programme marks the start of a three year initiative which will see a team of travel advisors dropping by a third of the city’s homes chatting to people about how they travel around the city. Next week the first group of houses in the East End will be contacted by travel advisors and a further 4,000 houses will receive postcards in the coming weeks letting them know that the travel advisors will be on their way soon. Plymotion on Your Doorstep focuses on having a face to face chat about local people’s current travel and their transport choices. The travel advisors will offer information and incentives that could help individuals and their families to save time and money, improve their health and fitness, or maybe just explore new places around our city. But Plymotion isn’t just about promoting different transport options- the Team also want to understand want to understand people’s travel needs and things the Council to do to make it easier for people to get around. The Plymotion Team will be easy to spot when they’re out and about in the community in their blue Plymotion uniforms and they will carry personal identification. It’s hoped that residents will take advantage of the free ‘one to one’ advice aimed at increasing awareness and use of Plymouth’s sustainable travel options. Next summer the Plymotion team will be visiting 14,900 homes in the city centre, Devonport and Stonehouse areas followed by 23,700 households in Plympton and Plymstock in summer 2014. The team will also be offering travel planning advice to businesses in these areas each autumn. The Council’s Plymotion on Your Doorstep initiative is part of Plymotion, a Department for Transport (DfT) funded project aimed at encouraging residents to lead more active, healthier lives while helping Plymouth to become a more sustainable city. I know its early days but I cant help but get the feeling that this site looks trendy but lacks substance. I hope that over time I am proved wrong. It all feels just a bit too gimmicky for my liking so far. 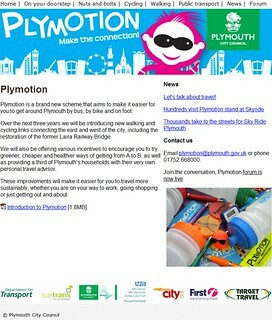 There is no mention of the much more promising Plymgo site which seems to have been given up on. When it worked Plymgo gave a very useful bus planning service with an even more useful real time option which no longer functions. I cant help but feel that the City Council would be better off spending this money on getting Plymgo and the real time displays working again. As a professional website designer myself, that is a very neat website. What you want, where you want it, when you want it. Easy to read, good job!! Sorry but is this *really* an effective use of Plymouth Council Taxpayers / DFT's money? A laudable idea perhaps but I fail to see why the Council should feel the need to take on a role of providing "personal travel advisors" to its residents. What patronising nonsense. Oh how I wish Councils would get back to concentrating on their traditional roles rather than empire building by "encouraging residents to lead more active, healthier lives while helping Plymouth to become a more sustainable city", amonst other things. Pointless drivel IMO, no wonder the country is in a mess! City Council is trying to justify the money spent on the East End "improvements". 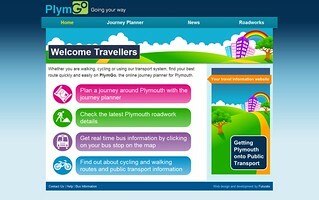 As to the Plymgo website it would be okay if it were updated regularly. Road works and road closure information is often missing or out of date. I am surprised this is being funded in these times of austerity. Most local authorities are just about keeping their heads above the waterline with limited resources to carry out their statutory responsibilities. That said, the concept is a good one, and the aim to increase sustainable travel solutions for residents will have benefits. It looks like the City Council have done a good job here in marketing this and having a plan in place to deliver this to residents. Not everyone I'm sure will be interested but even if a small number take this up it's a positive step. For shorter journeys walking should be encouraged. For those longer journeys in the city then this is where the bus can be promoted. For many years Plymouth had what I would describe as a really intensive bus service where it seemed you were never more than a few stumbles from the nearest bus stop. The network is more focused on key corridors now where a simpler and more frequent service can be offered. If people can be encouraged to look to walk where practical and to walk to catch the bus on those key corridors then this will be a good thing. I think the most important thing is getting the 'real-time' displays working again, both on Plymgo and on the bus shelters. Quite a lot of people simply turn up to the bus stop unaware of the timetables and the first thing nearly everyone looks at is the real time display. These are in desperate need of fixing!